Be the first to share your favorite memory, photo or story of Deacon Eyvind. This memorial page is dedicated for family, friends and future generations to celebrate the life of their loved one. 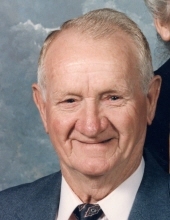 Deacon Eyvind Hamilton, age 91 of Teaberry, Kentucky, passed away on Tuesday, January 29, 2019 at his residence. He was born February 8, 1927 in Pike County, Kentucky to the late Steve & Rose Annie Hamilton. He was the husband of Dillie Johnson Hamilton. He was a retired coal miner and deacon & member of Samaria Old Regular Baptist Church. He is survived by his Children: Beulah (David) Peters of Berea, Kentucky, Brenda (Walker) Howell of Teaberry, Kentucky, Glendia Mitchell of Teaberry, Kentucky & Carolyn Sue (Garyl) Damron of Pikeville, Kentucky; Daughter-in-law: Clara Hamilton of Teaberry, Kentucky; Grandchildren: Levi Jr., Michelle, Brenda Lee, Debbie, Dusty, Nick, Julie, Marsha, Jeffery, Tina, Stevie, Shantana, ShaBree & Spouses; A Host of Great Grandchildren & Great Great Grandchildren; Along with his parents & Brother & Sisters: Pearlie Hamilton, Orpha Hamilton, Edna MacCauley, Roxie Novak, Mildred Weaver, Geneva (Maxie) Flora, Nana Belle Eller, Clarence Hamilton, Lexie Hamilton & Jacqueline Hamilton and wife he was preceded in death by his son: Levi Hamilton and grandson: Dwayne Hamilton. With his passing this ended the children of Steve and Annie Hamilton. He will be sadly missed by all that knew and loved him. "Email Address" would like to share the life celebration of Deacon Eyvind Hamilton. Click on the "link" to go to share a favorite memory or leave a condolence message for the family.